We've been on a glitter kick lately, so it seemed only natural that we make a sparkly paint recipe to go along with our moon study for unit two of My Father's World Kindergarten. 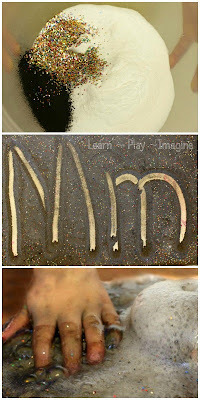 The boys had so much fun with our erupting moon dust, so the next day we made homemade moon dust paint. We prefer homemade paint to store bought, and this paint recipe was a huge hit. Directions: To make our moon dust paint we started with a base of crushed black chalk. Black powdered tempura could easily replace the crushed chalk. I set out small containers of water and glitter for the boys to add to the crushed chalk. I didn't measure any of it, but I intentionally only used a small amount of water. Only a small amount is needed to make paint with crushed chalk. 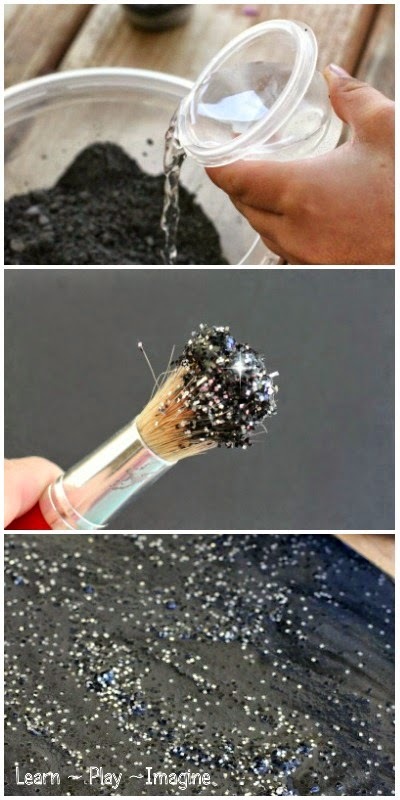 Once the boys added in all the water and glitter they mixed it well with their paintbrushes. I used both black and silver glitter to achieve a super sparkly yet dark paint. Of course my toddler twins couldn't resist using their hands. This paint recipe was just the right consistency and spread easily with paintbrushes while also having a unique texture too inviting not to touch. Our moon dust art was the perfect activity to end the school day. The paint dried lighter than I expected, most likely due to the chalk base. It looked pretty darn cool. Could I do this activity with 3 year olds?